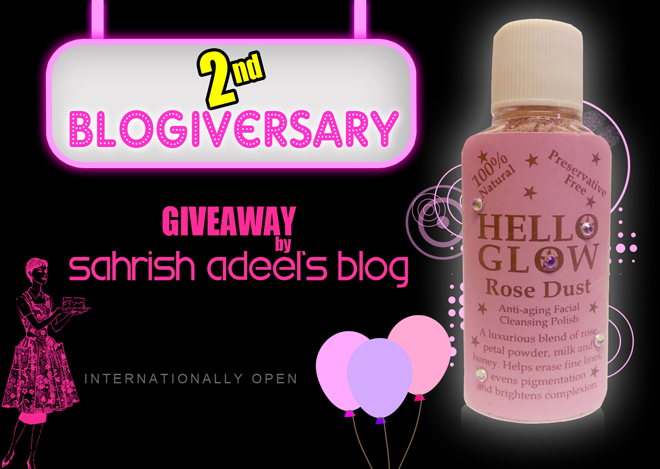 2nd Blogiversary Giveaway - Internationally Open | Sahrish Adeel - Malaysia based Pakistani Beauty & Lifestyle Blogger! As the title of this post says, it is my blog's 2nd anniversary. =D I am celebrating this by having a few giveaways on my blog. This was never ever possible without your continuous support, love and encouragement. <3 Thank you for being so awesome. Let's go to the rules and without wasting anymore of your time. Please note that this is a Rafflecopter giveaway and you should be able to see the widget below. I will verify the entries so do follow the rules. This giveaway will have one random winner and is open internationally. Winner will receive one bottle of Hello Glow Rose Dust - Anti-aging Facial Cleansing Polish. This giveaway is sponsored by the company. You will get to do a few tasks to earn entries, some of them are compulsory while some of them are just to increase your chances of winning. Provide information where I have asked in the widget, this will help me to verify your entry. If you have any questions, feel free to leave a comment. Thank you for your time. Don't forget to Like, Tweet or Pin this post.